Wolves in South Dakota, in this day and age? Impossible right? 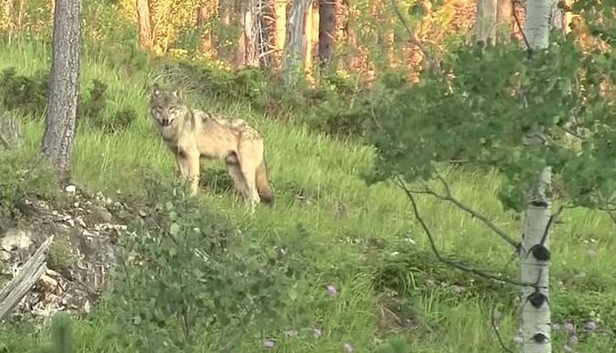 Well, apparently not - a video obtained by TrailMob clearly shows a gray wolf allegedly roaming the Black Hills. For thousands of years, hot mineral springs were used by indigenous people for healing purposes. Grizzly bears, black bears, wolves, and buffalo roamed and lived in these sacred mountains. However, they all disappeared with the illegal trespassing into this area by Euro-Americans in the late 1800s. Responses to "First Gray wolf sighting in the Black Hills - Sacred Place To Native Americans"
I love the elegant way he lopes off. You are so fortunate to have seen him (?her).